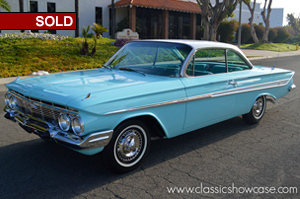 This concours restored first-year 1961 Chevrolet Impala Super Sport Bubble Top has been loving cared for and maintained over the years prior to its restoration and has only 14 miles since its very recent refurbishment. It comes with its carburetor, intake, exhaust manifolds and distributor that are all dated from 1961. It features the rare 409 CI V-8 engine with a 4-barrel carburetor, aluminum intake manifold, dual exhaust, 4-speed manual transmission, power steering, power brakes, tinted glass, heavy-duty police suspension (which included stiffer springs, heavier shocks, a beefier front sway bar) and spinner wheel covers with whitewall tires. Outfitted in a lovely Sea Mist Turquoise, the complementing two tone color Turquoise SS interior is a study in purposefulness, incorporating a split front bench seat, Impala trim, a 7,000 RPM Sun tachometer, fuel and water gauges, in-dash clock, passenger grab handle, dual snorkel air cleaner, and the original floor-mounted shifter with console plate. The 1961 full-size Chevrolets were all new, featuring a 119-inch wheelbase chassis, revised powertrains and a new performance-oriented Impala SS model. The “bubble top” has become a very sought-after body style because of its iconic design and racing heritage. At the top of the powertrain offerings was a new 409 W-Series Chevrolet V-8. It featured a 4.3125-inch bore and a 3.5-inch stroke. With an 11.25:1 compression ratio, it developed 360 HP at 5,800 RPM, with only 142 cars received this engine in 1961. Like the rest of the car, the engine compartment and 409/360 HP engine are exceptionally clean and well detailed with all correct accessories and surfaces. As a testament to its high quality, it won a Gold award with a score of 981, in its 1st showing. An excellent example for a discerning collector as one you would love to have in your collection. The year 1961 was the first time Chevrolet offered the Super Sport package that would come to define Chevy muscle throughout the 1960s. Introduced midway through the model year, the Super Sport package was offered on all body styles in the entire Impala line. For the first time in several years the full size Chevy was finless! The '61 Impala still sat on the GM "B" body platform and rolled on a 119-inch wheel base. The Impala body was now 1 ½ inches shorter, giving it a trim and boxy look. The Impala line stuck with its signature three taillight designs. The Impala and Bel Air two-door sport coupes each featured new roofline styling. This new roofline line would become known as the "bubbletop." 1961 was the only year for an Impala two-door sedan model. Very few were produced, and it is a scarce collectible today. The big news for '61 was the mid-year introduction of the Super Sport model and the new monster 409 ci engine. These two new entries to the Impala lineup were an instant success! Factory production numbers for the new "SS" for 1961 are approx. 453 units; with approx. 142* of these featuring the new Turbo Fire 409 ci engine. Although the Super Sport 409 package was available on any Impala it is unlikely it appeared in anything but sport coupes and convertibles. Engine choices included the single 4-barrel-equipped hydraulic-lifter 348 CI big-block V-8s rated at 250, 280, 305 and 315 HP, a triple 2-barrel solid-lifter tri-power-equipped version rated at 335 HP, and the new-for-1961 409 CI Turbo-Fire engine. The 409 was a serious performer: a bored-and-stroked version of the 348 with a single 4-barrel on an aluminum intake manifold, 11.25:1 compression and a solid-lifter cam combining for a factory rating of 360 HP. Power steering and brakes, heavy-duty tires on station wagon wheels, special springs and shock absorbers, and sintered metallic brake linings formed the basis of the SS package.